But first, the scripture. FOR IT IS WRITTEN! Barack (6) Obama (6) Junior (6). If you take the amount of letters of his name, just as the scripture warns, it translates to a number. The number of this man is 666. Much like Jesus was born to God, the AntiChrist must be born unto a father whose number is just as evil and related. Behold: Barack (6) Obama (6) (Senior) (6). 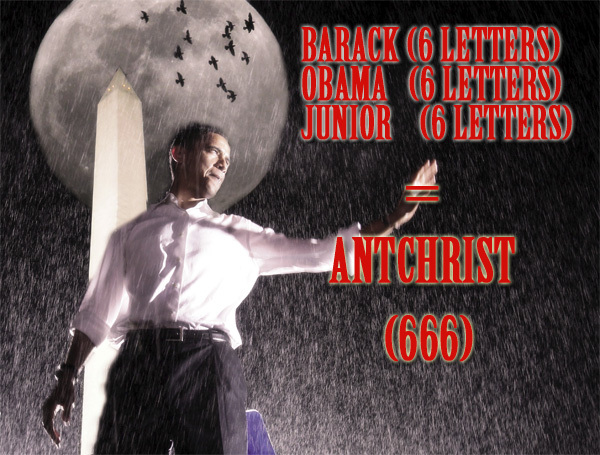 But Wait, How Does Obama have Six Letters? Headline happy liberals by now are cackling and spreading this article around, mocking Republicans because they think we cannot count. Obama does not have six letters, typical ‘hillbilly’ Republican! they say. Well, here’s the facts. The Obama surname is of Dholuo etymology, that is, the language spoken by Obama’s tribe in Kenya and Tanzania. The word (Bam, Bama) in Dholuo means (of crooked birth). Attached to a surname in the Dholuo language is usually a distinction. The Bam family (Obama’s ancestors) received the distinction O-. In Dholuo, Obama’s name is actually o-bama or ↄ-bama. The true Obama name has six letters to it, but we can see how Obama is trying to hide his true name from us all. This is why the Bible says it will take ‘wisdom’ to figure it out. You have to research the true name and the true name is Barack o-bama Junior, or more accurately, Barack ↄ-bama Junior. That is 6 letters. Now that you have paused to take in this information, we as a community of peers must decide what to do with it. I encourage you all to pray, for we are already in the End Times. I have already started to create propaganda posters to inform the public, so please feel free to share this article revelation with your friends on Twitter, AOL Messenger, Facebook, MSN Messenger, Friendster. All of them! The end days are here. We are living in cruel days, evil hours. The AntiChrist is in office and we can only expect it to play out from here on like Left Behind. Be well, my friends. Be safe. Take care of yourselves and each other, and look toward prayer as we see Obama rise in power. I just want to know where to get a poster. I really REALLY want a poster. Obama is 5 letters, not 6. O.B.A.M.A. How f* stupid can you people get?